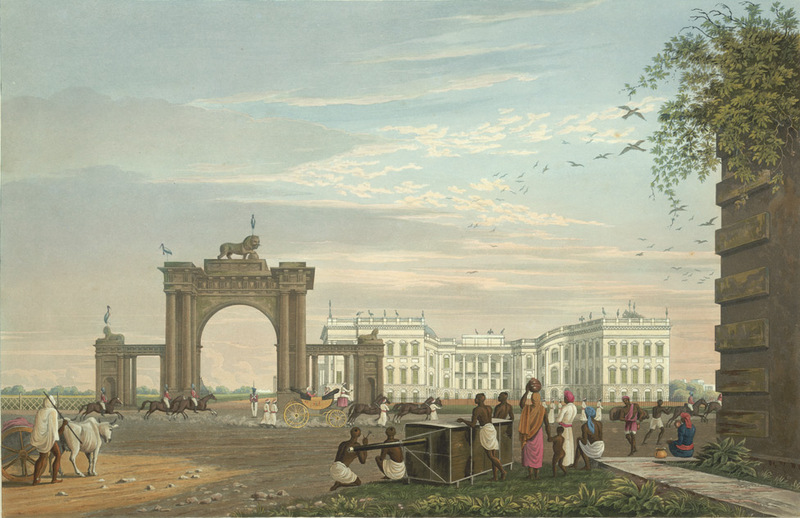 This is plate 3 from James Baillie Fraser's 'Views of Calcutta and its Environs'. Fraser (1783-1856) arrived in Calcutta in 1814 and in six years produced these animated sketches of the busy city. He devotes three views in his collection to the Government House, all of them taken along its eastern side. Government House was built by Marquess Wellesley, who had became Governor General in 1798. The architect Captain Charles Wyatt based his design on that of Kedleston Hall in Derbyshire, but with modifications dictated by the climate.